Two new start ups aim to make money by arranging for people to work while they globe trot -- you just need to bring the job. It's a common dream -- get paid while traveling the world. Two startups are helping people make this happen. The only catch: you bring the job. Earlier this week, 75 people (mostly young, mostly techies) showed up in Prague for a month's stay. While there, they'll do their regular day jobs from a shared workspace. In the off time, they'll be free to explore the country. After Prague, it's off to Slovenia. Then Croatia. Then Istanbul. Ultimately, they'll spend a month each in 12 locations around the world -- living, working and traveling together throughout Europe, Asia and South America. "A lot of people want to do this, but they don't because it's scary," said Greg Caplan, founder of Remote Year, the company running the program. So Caplan makes it easier. 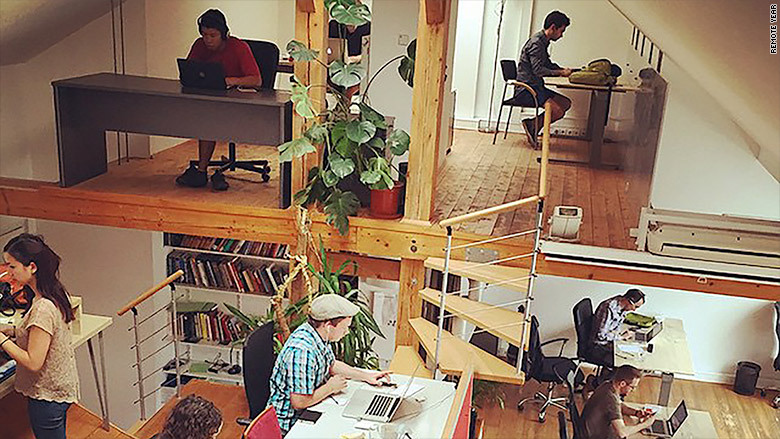 He charges each person $2,000 a month, which gives them access to a shared work space, their own room and all travel tickets once they reach Prague. "Productivity has gone to the cloud," said Caplan, 26. "You don't need to be at a certain desk anymore, or in a certain city anymore." Obviously, the program isn't for everybody. The biggest barrier is having a job that allows you to work remotely -- and also pays relatively well. Caplan figures about $45,000 a year is needed to pay his fee and have enough left to live comfortably. That's a lot, but it's probably less than many professionals spend each year in a big U.S. city. Most of the participants are web developers, digital marketers and the like. But there's also a handful of writers, accountants and lawyers. One woman works in sales, and simply makes her calls to Michigan during evening hours. The average age is 30, though people range from 22 to 49. Americans make up over half the group, with the rest coming from India, Brazil, Australia, New Zealand and various European countries. Cassie Utt, a 24-year old IT professional, convinced her bosses at Eaton -- a 100-year-old maker of industrial equipment -- to let her do Remote Year. She said the trip would let her build relationships in the firm's many foreign offices, and noted that it wouldn't cost the company anything extra. "I had anticipated this being a difficult sell and put together a lengthy business proposal," said Utt. "Oddly enough, it wasn't." So she let the lease lapse on her car and apartment, put her stuff in storage and bought a new suitcase, web cam and phone headset. This is the first trip organized by Remote Year, and Caplan said he's making just enough money to cover the yearly expenses for himself and his five employees living abroad with him. He said 25,000 people applied for the 75 slots. He was looking for a diverse group of people and those who would be successful working remotely. He narrowed it down with individual essays and Skype interviews. Establishing a community while traveling was a theme Caplan kept returning to, and it's central to one of Caplan's competitors as well. Hacker Paradise was formed in 2014 after co-founder Casey Rosengren, a web developer and marketer, wanted to travel in Central America but was hesitant to leave his community in New York. "Typically, when you travel, you're surrounded by the backpacking crowd and people partying every night," said Rosengren, 24. "It's not really conducive to work." So he called up some pals, posted ads on tech boards, and soon had 15 people headed to Costa Rica for a three-month stay. Having that group of people together, with everyone feeding off each other's ideas, fostered more productivity and creativity in everyone, he said. "It started out as a hobby, but the people had such a good time, and got so much out of it, we couldn't not do it again." Southeast Asia was next, and last week the third trip started in Europe. 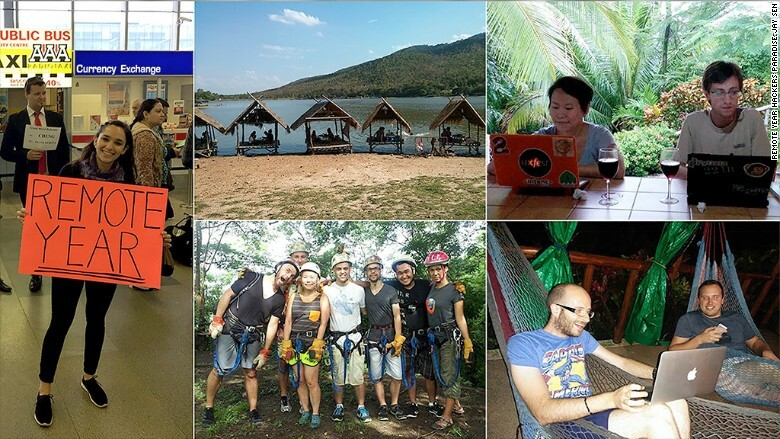 Hacker Paradise is a bit more informal than Remote Year. It costs $750 a month, but only covers the workspace and various activities. Trips are generally for three months, and people can come and go as they please. Rosengren said over 300 people applied for 30 slots. Like Caplan, he's only making enough to cover his expenses, but he has plans to expand the program. "There seems to be so much need for community around travelers," he said. "It's a lot like freshman year at university."